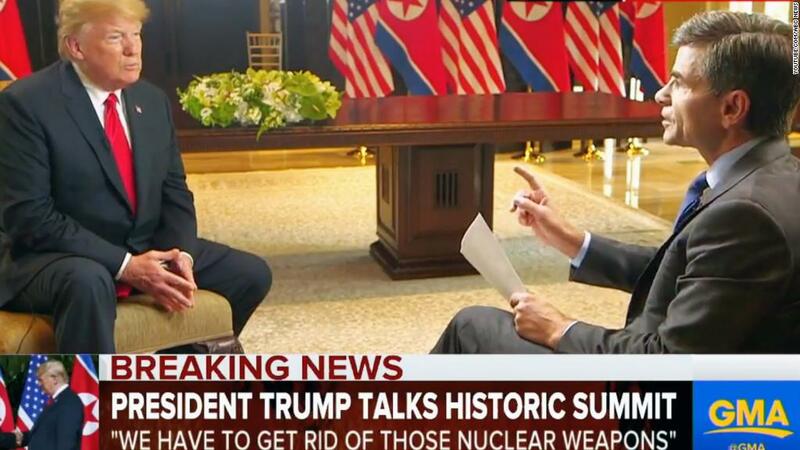 Here's one sign of President Trump's confidence about this summit with North Korean dictator Kim Jong Un: Trump gave a lengthy press conference and three TV interviews right afterward. One of the interviews was with Fox News' Sean Hannity, arguably his single biggest supporter on television. That's no surprise. Hannity's show is one of Trump's shelters from the storm around his presidency. But Trump ventured out of that safe harbor for sit-downs with ABC's George Stephanopoulos and Voice of America's Greta Van Susteren. The apparent goal: To persuade the wider public, not just his base, that the summit was a success. The interview with ABC was Trump's first interview with a major network not named Fox in 13 months. The White House curtailed Trump's TV interviews in May 2017 after he spoke with NBC's Lester Holt shortly after firing FBI Director James Comey. In that interview, the president said the Russia probe was on his mind when he fired Comey. After the Holt interview, he kept going on Fox's opinion shows and also on Christian broadcasting outlets, but none of the traditional broadcast networks like ABC. So his decision to speak with Stephanopoulos is significant, even if it's just a one-off. The ABC interview aired on "Good Morning America" Tuesday morning. Stephanopoulos challenged Trump's praise of Kim, at one point saying, "You say his people love him. Just a few months ago you accused him of starving his people. And listen, here's the rub. Kim is a brutal dictator. He runs a police state, forced starvation, labor camps. He's assassinated members of his own family. How do you trust a killer like that?" "George," Trump said, "I'm given what I'm given, okay I mean, this is what we have, and this is where we are, and I can only tell you from my experience, and I met him, I've spoken with him, and I've met him. And this was, as you know, started very early and it's been very intense. I think that he really wants to do a great job for North Korea. I think he wants to denuke, it's very important. Without that, there's nothing to discuss." Trump also spoke with Van Susteren, who left Fox in 2016 and now hosts a program on the Voice of America network, which is funded by the U.S. government and shown around the world. The trio of interviews was followed by a full-blown presidential press conference, Trump's first in 16 months. Trump has held a number of impromptu Q&A sessions -- where he surprises reporters by answering questions while sitting in the Oval Office or walking to Marine One -- and joint press conferences with other world leaders. But since taking office, he's only held one formal press conference, and that was back in February 2017. What makes it "formal?" Among other things: Scheduling the event in advance and ensuring that many members of the press corps, not just a small group, are in the room for it. At Tuesday's presser, Trump spoke for over an hour. He left most of his media bashing rhetoric back at home. "President Trump seems to be feeling very confident, which is why he's holding first wide-ranging news conference like this in nearly a year and a half," CNN's Jeff Zeleny tweeted. "I can't help but wonder whether he's going to be very surprised by headlines and critique that he gave up more than he got."